Remote desktop is not new term for the time being as it is being used either for personal or business use. Remote desktop software enables users to remotely control another device from miles away. You might be familiar with TeamViewer and use it. TeamViewer is basically the most popular and matured remote desktop tool available in the market. It is free for personal use and need to buy license for commercial use. I like TeamViewer but what most annoys me most about it is that, it constantly shows a nag screen saying 'Commercial use suspected', even though i use it for personal works. But enough about TeamViewer. 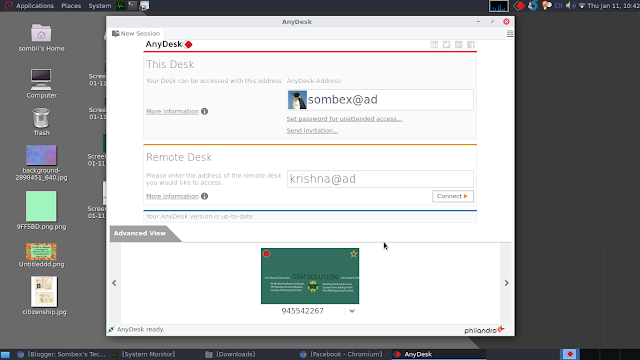 Anydesk is a free powerful remote desktop software available for Windows, Linux, Mac and Android. It is fast and simple, as well as lightweight than TeamViewer. And most of all it doesn't nag users to get commercial license on personal use. AnyDesk's GUI is very clean and simple, you wont get confused. We will talk on how to use it later on this article. I have used both software on my Linux and Windows machine. Below points are my personal opinions what i experienced during usage. I used free versions of both software. Speed: In terms of speed, both do really well. I really can't find any diffrence. Now that we have learned something about AnyDesk, lets get to install it. AnyDesk is not available in official Debian repository. 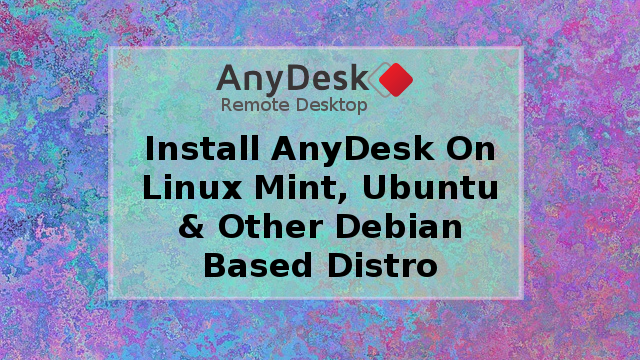 We will download the latest AnyDesk package from AnyDesk site and install it on you Linux Mint, Ubuntu or Other Debian based distors. Head to the download site form the below link and download according to your OS architecture. I have a X86_64 OS, so i will download the 64bit package, if you have X86 OS than download 32bit package. To find your OS architecture, issue 'lscpu' on terminal. Now, to install the downloaded AnyDesk package. If you have GDebi Package Installer, i recommend using that. GDebi will automatically install all required dependencies. Using apt-get will also list all dependencies and install them. Do not use dpkg to install .deb files as it will ignore all the dependencies of the package. 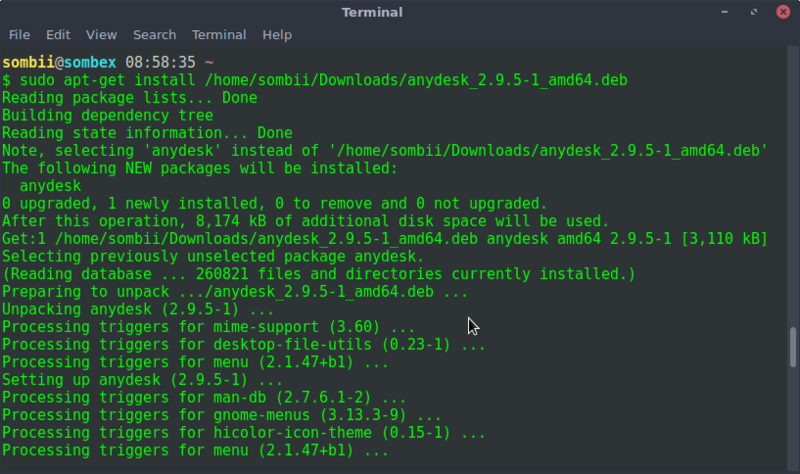 Now open a terminal and use the following command to install AnyDesk. 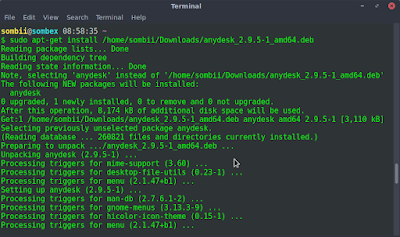 Now '/home/sombii/downloads/anydesk_2.9.5-1_amd64.deb' is the path where i have anydesk package, change it to yours. After installation you should be able to see AnyDesk icon on your application menu (Internet/Communication) or search anydesk. How to Remotely Control a PC Using AnyDesk? Now that you have installed AnyDesk on your system, lets see how we can control PC using it. First of all make sure both PC have AnyDesk installed and running. After running Anydesk it will give your pc a unique address called AnyDesk Address. Ask for the address form the pc user whose pc you want to use remotely. In my case, my address is [email protected], now i will provide this address to someone who wants to remotely control my pc. After providing the address they will try to connect and AnyDesk will ask you to allow the connection or deny it. Below is a screen shot of AnyDesk running on my Debian 9.3 Stretch (Mate). And thats the end of this article, as always leave your comment if any issue or anything. Both anydesk and teamviewer are good. But if you are looking for any alternatives, you can have a look at on premise R-HUB remote support servers. It works on all platforms plus works from behind the firewall, hence better security.